You really upsets me. When a person send you any material, I am sure that you need to use your brain to think, to identify, to locate for the truth before give it to you or anybody else, this is what I meant yesterday. You know baby wessex has one eye nearly blind, how could this baby POSSIBALlY be Edward???? Have you EVER thought about it before you post it??????? You replied to me three times and never got my point-a person sent to you anything you would believe instantly??? You kept saying this is from a friend and this is what friend says. For your life too, YOU NEED ALWAYS TO THINK BEFORE YOU ACT. I read this as a question - is this Louise or Edward? 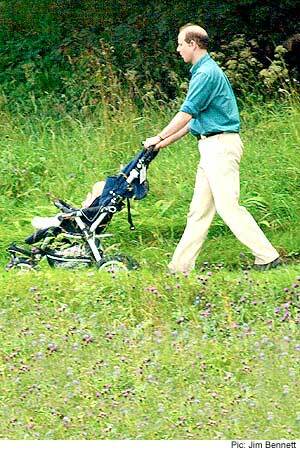 Didi anyone see the artical in the Daily Mail about Edward pushing Louise around in her stroller at Balmoral. Louise is barely visible, in her white babygrow. I wish I could paste the photo, but I've forgotten how. I'll try anyway. if this is an open site, then people is free to talk. Aww, that's so cute! Thanks for the pic, Claire! Elsa said that the photo that appeared in print. Showed Louise waving her arms about and little blond curls. I can't get anything from that photo through, no matter how much I enhance it. It's just really nice to see Louise out and about. She's 9 months already, she could be crawling. I am patient with people, please so not take me wrong, somehow I have tried to get Cundrestood about my point, it is a very kind suggestion from me to C, nothing offensive! Please do not misunderstand. I just realize that many among us do not speak English well, or may be not even speak "C" English which has caused everybody hard to understand. Maybe I should be thinking about how to polish my language. Pls thanks for the photo you shared with us. If any body has Louis' photo, please post it. I have been looking at the photo Carazon posted and it really could be Louise. I base this on the previous photos we have of her, from Christmas and from her christening. Yes, I know about the eye, but I so hope that that have corrected itself and you would not be able to tell that from a photo anyway, it can only be seen when you focus and move the eye on objects. I doubt it's Edward as colour photos of him as a baby as scare and grainy. This photo appears to be in good nick. So it REALLY could be Louise. if have picture of her like gettyimages or whatever please show me! but i cant enter that articles because i have computer problems! While this is certainly an open discussion forum, there are rules to abide by. And one of those rules includes not attacking other members. Nobody else seemed to find issue with corazon's question or his/her posting of the picture. It was simply a misunderstanding/innocent question; there was no need to attack him/her for erroneously posting it or whatever. Let's continue to respect each other, the rules of this forum and return to our discussion of Lady Louise. Can you simply explain who you are and what title you have associated with this forum before I say somthing. If C is innocent, then I am simply to suggest her to be more sophicicated. I do not know why you are so sensitive to the "difference". Life is very simple, turth or not, Please do not fake truth as you attaked me as a untruthful and trublesome person. People on the F is free to express their true feelings, as they live in the U.S., this is U.S. You, as a administrator, pls give yourself and others more freedom and space to allow them to express their feelings, that is what I belive can make this F sucful. I hope you are not from communist country and do not carry any faith of controling people. America does not allow dictactorship and I DO NOT CARE who you are-Everybody has been very honest on this F and we are happy to discuss royalty issue here, and we are tring to discuss and share our opnion, that all! I have explianed before that I do not against C but trying to help her AND I WILL NOT REPLY TO YOU MESSAGE ABOVE AGAIN becuase I think it is senseless. If you have different faith than anybody else, pls SIMPLY close this F. If your want to keep it. do not mass up things here, THERE IS REALLY NOTHING YOU SHOULD WORRY ABOUT beacuse everthing has been posted on the F really has nothing to worries you and there are some disagrements there but not leading anyone mad and If you opened this F just for your personal purpuse to have people chat on the internet to entertain you, then you simply got all of us wrong. Alexandria is an Adminstrator of this forum, Gloria, as stated under her username. That means she's one of the senior people here and it's her responsibility to ensure the smooth running of the site. She's asking you to abide by the rules that require posters to treat each other with respect. It's perfectly possible to speak one's mind freely while doing so. Good article and cute photo! Thanks, Claire! 1. I do not think we (means members) have gong over the limit which resulted which I think ever had happen as you might have thought. We were not arguing abut discussing. It shou;d be allowed by this F.
2. As I stated clearly that I was helpping C out. 3. With your judgement, I was disrepectfull memebrs and arguing with C which I have explianed MANY TIMES already. Why do not you read before. Now it is up to me to think that you are not disrepecting members. YOU DO NOT COME TO MEMBER WITHOUT EVEN TRY TO UNDERSTAND THEM FIRST. 4. If you want me to respect you, you should repect me first. If I want to be treated the way I want to be treated by others, I start myself first., which means I start to treat people kindly with respect if I want the same from people. Well no more arguing, it is wasting time to argue. A dministrator is the title, what she does has to be rightous. A TITLE DOES NOT PERSUADE PEROPLE, SO DO NOT CONTROLL PEOPLE BY ITS TITLE. TITLE DOES NOT MEAN ANYTHING, ACTION IS THE KING. I WILL NOT EXPLIAN AGAIN THE FACT THAT IT WAS JUST A DISCUSSION BUT NOT ANY SORT OF ARGUMENTS BETWEEN THE MEMEBRS. DO NOT MAKE THING MORE COMPLICATED THAN IT ACTULLY !!!!!!!!!!!!!!!!!!!!!!!!!!!!!!!!!!!!!!!!!!!!!!!!!!!!!!!!!!!!!!!!!!!!!!!IS!!!!!!!!!!!!!!!!!!!!!!!!!!!!!!!!!!!!!!!!!!!!!!!!!!!!!!!!!!!!!!!!!!!!!!!!!!!!!!!!!!!!!!!!!!!!!!!!!!!!!!!!!!!!!!!!!!!!!!!!!!!!!!!!!!!!!!!!!!!!!!!!!!!!!!!!!!!!!!!!!!!!!!!!!!!!!!!!!!!!!!!!!!!!!!!!!!!!!!!!!!!!!!!!!!!!!!!!!!!!!!!!!!!!!!!!!!!!!!!!!!!!!!!!!!!!!!!!!!!!!!!!!!!!!!!!!!!!!!!!!!!!!!!!!!!!!!!!!!!!!!!!!!!!!!!!!!!!!!!!!!!!!!!!!!!!!!!!!!!!!!!!!!!!!!!!!!!!!!!!!!!!!!!!!!!!!!!!!!!!!!!!!!!!!!!!!!!!!!!!!!!!!!!!!!!!!!!!!!!!!!!! !Any wrongful jugdemnts by any authoroties of this F about me WILL NOT BE EXCEPTED. We have administrators and moderators volunteering their time here to help make sure that this is a pleasant environment for all. A forum of this size requires some type of order and that order includes members (everyone posting here) being nice and respectful to one another. Now, Alexandria, Martine and Elspeth have very politely asked you to please be respectful of other people's comments and they have done so in a very nice manner. Now, I will also ask you to please refrain from making remarks that could possibly hurt the feelings of other members. I sorry by this scandal, single I ask because tapeworm the single doubt...... was that and if annoying I leave the forum, is no problem. Corazon, please don't worry about it. Thank you for posting the picture!